No Scanner, 8MP Camera, Android Jellybean, Standard Capacity Battery, Wi-Fi, 1GB/8GB. Includes USB cable and 2 year service contract. Charging Cradles and Power supply Sold Separately. Single charging cup (Part# Cable-TC55-CHG1-01) needs power supply (Part# PWRS-124306-01R). 5- slot- CRDUNIV-55-5000R REQUIRES POWER (Part# PWRS-14000-148C) AND AC LINE CORD (Part# 23844-00-00R). No Scanner, 8MP Camera, 4G LTE Verizon Data Only, Wi-Fi (802.11a/b/g/n), NFC, GMS, Android Jellybean, 1GB RAM/8GB ROM, Standard battery. Includes USB cable and 2 year service contract. Charging Cradles and Power supply Sold Separately. Single charging cup (Part# Cable-TC55-CHG1-01) needs power supply (Part# PWRS-124306-01R). 5- slot- CRDUNIV-55-5000R REQUIRES POWER (Part# PWRS-14000-148C) AND AC LINE CORD (Part# 23844-00-00R). No Scanner, 8MP Camera, 3G Verizon Voice and Data, Android Jellybean, Expanded Battery, Wi-Fi, 1GB/8GB. Includes USB Cable and 2 year service contract. Charging Cradles and Power supply Sold Separately. Single charging cup (Part# Cable-TC55-CHG1-01) needs power supply (Part# PWRS-124306-01R). 5- slot- CRDUNIV-55-5000R REQUIRES POWER (Part# PWRS-14000-148C) AND AC LINE CORD (Part# 23844-00-00R). LIKE NEW. No Scanner, 8MP Camera, Android Jellybean, Standard Capacity Battery, Wifi, 1GB/8GB. Includes USB cable and 2 year service contract. Charging Cradles and Power Supply Sold Separately. Single charging cup (Part# CBL-TC55-CHG1-01) needs power supply (Part# PWRS-124306-01R). 5- slot- CRDUNIV-55-5000R REQUIRES POWER (Part# PWRS-14000-148C) AND AC LINE CORD (Part# 23844-00-00R). LIKE NEW. No Scanner, 8MP Camera, 4G LTE Verizon Data Only, Wi-Fi (802.11a/b/g/n), NFC, GMS, Android Jellybean, 1GB RAM/8GB ROM, Standard battery. Includes USB cable and 2 year service contract. Charging Cradles and Power supply Sold Separately. Single charging cup (Part# Cable-TC55-CHG1-01) needs power supply (Part# PWRS-124306-01R). 5- slot- CRDUNIV-55-5000R REQUIRES POWER (Part# PWRS-14000-148C) AND AC LINE CORD (Part# 23844-00-00R). LIKE NEW. No Scanner, 8MP Camera, 3G Verizon Voice and Data, Android Jellybean, Expanded Battery, Wifi, 1GB/8GB. Includes USB Cable and 2 year service contract. Charging Cradles and Power Supply Sold Separately. Single charging cup (Part# CBL-TC55-CHG1-01) needs power supply (Part# PWRS-124306-01R). 5- slot- CRDUNIV-55-5000R REQUIRES POWER (Part# PWRS-14000-148C) AND AC LINE CORD (Part# 23844-00-00R). 1D Linear Imager, 8MP Camera, Android Jellybean, Standard Capacity Battery, Wi-Fi, 1GB/8GB. Includes USB cable and 2 year service contract. Charging Cradles and Power supply Sold Separately. Single charging cup (Part# Cable-TC55-CHG1-01) needs power supply (Part# PWRS-124306-01R). 5- slot- CRDUNIV-55-5000R REQUIRES POWER (Part# PWRS-14000-148C) AND AC LINE CORD (Part# 23844-00-00R). 4G Non-GMS for Verizon, Data Only, 1D Scanner, Standard Battery, Android Jelly Bean Charging Cradles and Power supply Sold Separately. Single charging cup (Part# Cable-TC55-CHG1-01) needs power supply (Part# PWRS-124306-01R). 5- slot- CRDUNIV-55-5000R REQUIRES POWER (Part# PWRS-14000-148C) AND AC LINE CORD (Part# 23844-00-00R). Wi-Fi (802.11a/b/g/n), 1D Linear Imager, 8MP Camera, Android Jellybean, Expanded Capacity Battery, 1GB/8GB. Includes USB cable and 2 year service contract. Charging Cradles and Power supply Sold Separately. Single charging cup (Part# Cable-TC55-CHG1-01) needs power supply (Part# PWRS-124306-01R). 5- slot- CRDUNIV-55-5000R REQUIRES POWER (Part# PWRS-14000-148C) AND AC LINE CORD (Part# 23844-00-00R). 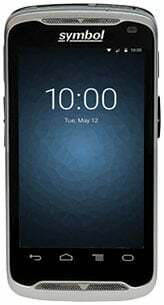 Wi-Fi (802.11a/b/g/n), 1D Linear Imager Scanner, 4G LTE Verizon (Data Only), No GMS, 8MP Camera, Android Jellybean, 1GB RAM/8GB Flash. Includes USB cable and 2 year service contract. Charging Cradles and Power supply Sold Separately. Single charging cup (Part# Cable-TC55-CHG1-01) needs power supply (Part# PWRS-124306-01R). 5- slot- CRDUNIV-55-5000R REQUIRES POWER (Part# PWRS-14000-148C) AND AC LINE CORD (Part# 23844-00-00R). No Scanner, 8MP Camera, Android Jellybean, Expanded Capacity Battery, Wi-Fi, 1GB/8GB. Includes USB cable and 2 year service contract. Requires power supply (Part# PWRS-124306-01R). 4G Non-GMS for Verizon, Data Only, No Scanner, Wi-Fi (8002.11a/b/g/n), Android Jelly Bean, Extended Capacity Battery. 1D Linear Imager, 8MP Camera, 3G Voice and Data, Android Jellybean, Standard Capacity Battery, Wi-Fi, 1GB/8GB. Includes USB cable and 2 year service contract. Charging Cradles and Power supply Sold Separately. Single charging cup (Part# Cable-TC55-CHG1-01) needs power supply (Part# PWRS-124306-01R). 5- slot- CRDUNIV-55-5000R REQUIRES POWER (Part# PWRS-14000-148C) AND AC LINE CORD (Part# 23844-00-00R). 1D Linear Imager, 8MP Camera, 4G LTE Verizon Data Only, Wi-Fi (802.11a/b/g/n), NFC, GMS, Android Jellybean, 1GB RAM/8GB ROM, Standard Battery. Includes USB cable and 2 year service conract. Charging Cradles and Power supply Sold Separately. Single charging cup (Part# Cable-TC55-CHG1-01) needs power supply (Part# PWRS-124306-01R). 5- slot- CRDUNIV-55-5000R REQUIRES POWER (Part# PWRS-14000-148C) AND AC LINE CORD (Part# 23844-00-00R). Dual battery charger - can charge 2x RFD8500/TC55 batteries via 3-slot cradle (Part# CRDUNIV-RFD8500-1R), the TC55 5-slot cradle (Part# CRDUNIV-55-5000R) or Rugged USB Charger (Part# Cable-TC55-CHG1-01).